 Welcome to Charging Moose Media! We are a production company focused on creating unique, high quality pieces of entertainment across a wide range of mediums. In the coming months we will be posting more projects to our portfolio and introducing new projects to you. Please take a look around and check out our company! Thanks for swinging by, and please follow us on Social Media! Season 2 of our award-winning web series, The Hunted: Encore is now available! Be sure to watch Season 1, and also check out our Soundtrack available on BandCamp, iTunes, or wherever you listen to music! A new podcast bringing table reads of brand new plays to a wider audience. Every month we will feature a new play from an emerging playwright, and under the direction of our Artistic Director Rachel Flynn, a fantastic group of actors will bring these plays to life. Click the button below to learn more, and to subscribe to all our new episodes! Swords, Songs & Slayers collide in this Musical Action Comedy that pits Megan and her team of vampire hunters against a sinister bloodsucking syndicate. Based on the hit LA web series, The Hunted, comes The Hunted: Encore. This Action Comedy Vampire Slayer Mockumentary Musical Web Series is sure to be like nothing you've ever seen before. There are two seasons now available, and the soundtrack is available for purchase on Bandcamp. With fresh takes on six classic hymns and carols, and five original Christmas tunes, "A Very Charging Moose Christmas" is now available on iTunes, Spotify, BandCamp, and more! Featuring an incredible collection of composers, arrangers and performers from Radio, Television, Broadway, and Film, this album is sure to be a staple on your holiday music playlist! The album can be purchased or streamed on all major outlets. On September 3, 2016, we met up with our good friends in Common Jack, to live record three songs off their new album Strange New State. On a rooftop in Queens, at sunset, with New York City as our backdrop, we recorded a fantastic set with them. All of the songs were live recorded, and filmed and then mixed in our studios by Marcus Thorne Bagala. If you are interested in a similar shoot for you or your band, please contact us through our Collaborate page! This musical project explores the question, "what would some of the best classic showtunes sound like if they were written for today's radio?" With a collection of incredible artists, this whole project is a love letter to musical theatre, and we are so excited with the results. With arrangements covering styles from Pop, to Hip-Hop, to Punk, to EDM, and more. If you are a lover of musical theatre, you have to hear these tracks.